A lobster in it's seabed habitat. 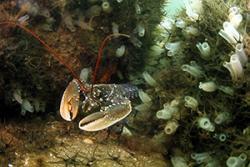 : Image credit: Pascal Dubois.The first and only fully-protected marine reserve in Scotland is proving highly beneficial for marine conservation and fisheries, with lobsters more than doubling in numbers and increasing in size. They found that protection in the marine reserve was beneficial for lobsters, with their density, length and weight all being greater than that found at other sites. Catches of egg bearing female lobsters were also twice as high in the reserve, and these females carried an average of 22 percent more eggs– increasing breeding potential.